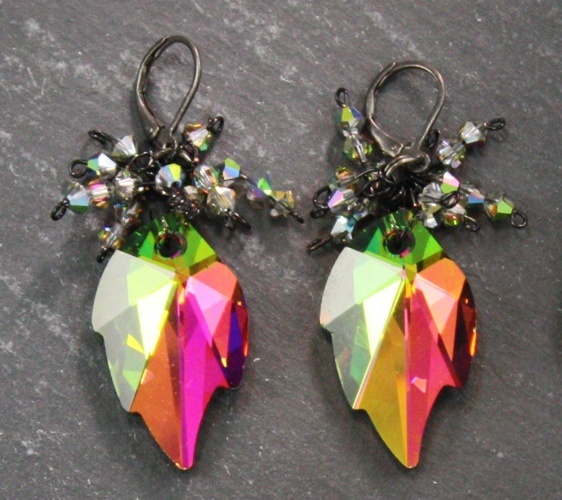 These statement making earrings will ensure you get attention as you enter the room. This style has a flounce of aurora borealis crystals atop of a large drop leaf crystal. The large leaf pendant crystal picks up light to sparkle even in a dim room, you will stand out wearing these beautiful Josephine earrings. • Great for evening jewelry, special occasion jewelry, bridal jewelry, wedding jewelry, bridesmaid jewelry, or holiday jewelry. Perfect formal evening earrings.